Delicious foods don't just fill up our bellies, but they also transport us back to our fondest memories of home. Here's a basket that's sure to remind them of excellent meal times shared with family and friends. It includes a robust Sausage, gourmet Flavored Cheese Spread, sharp Cheddar Cheese, and even more. Send your gratitude, your love, or remind them how much you care when you send Tastes of Home. 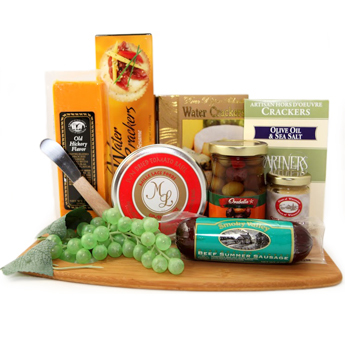 Please note: cutting board, plastic grape, and cheese knife are not included in this gift. They are used for the decoration only.